This is a great way of life Vinay and I have also been practicing this for some time and it helps to get the engines going in the morning. We all rush around so much and don’t give our bodies and minds enough space to just ‘be’ at times. Ayurvedic practice is an ancient art and only now are we coming back to it and realising the value of it. Keep practicing and keep mindful and thankful of the wonderful things we all have in life! You’re right . . . I think you’re completely crazy 😉 Getting up at 5am has never, ever been on my agenda . . . let alone high on it. I do get the principles though and they are sound. Please remember us owls out here who love being business owners who can structure our life and work around a different set of hours. I nearly fell over when I read this. I do love the principles though and gratitude and meditation practices have been part of my regular routine for many years, for me they come under the heading of ‘get yourself right first’. Other regular practices for me include working on the business not just in it. I love my 90dayplanning sessions and they’re the first in my diary each year. Thanks for the comment Mary! 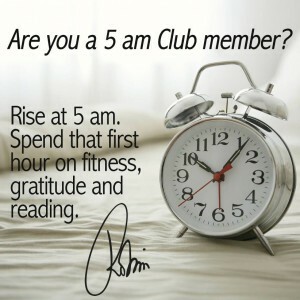 I love you owls as well and I totally get that 5am isn’t for everyone, that’s why I say “you don’t have to get up at 5am.” As you say the principles are sound and you can construct the practice to suit you. It just happens that 5am suits me because it enables me to get a head start on the day and be ready to walk a rather important little lady in my life to school in the mornings!